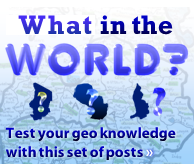 Below, you will find links to GeoFact of the Day Blog posts about each and every country in the world! In order to view more than one post without leaving this page, right click the link that you want to open and go to "Open in New Tab" in the pop-up menu (for most browsers). Thank you so much for visiting! This number is widely disputed: some people say 196, others even say "more than 200"! The "more than 200" crowd includes territories that do not have full sovereignty, so these territories should not be considered countries and should not count towards the total. If you count Taiwan, which currently does not have full sovereignty from mainland China, then 196 is likely the most acceptable number for you. The U.S. State Department is one major diplomatic entity that supports the 195 number. * Since AZERBAIJAN, GEORGIA, KAZAKHSTAN, and TURKEY are in Asia for the most part, they are listed under only Asia. RUSSIA is listed in both. CYPRUS is considered to be geographically in Asia, although it is an EU member and conflicting definitions of what Europe is would consider Cyprus to be a European country. Barbados Dominican Republic Jamaica St. Vincent & the Gren. Either interactive map or both maps may not appear in particular internet browsers.